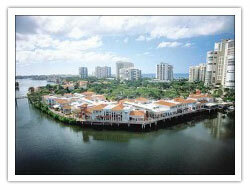 Southwest Florida between St. Petersburg and Naples has a lot more to offer than blue water and white beaches. 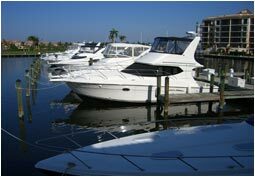 St. Petersburg and Tampa are the most densely populated cities in the area and are rich in art and culture. 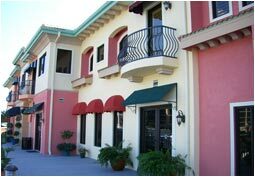 Tampa is characterized by Latin traditions and Lifestyle and Architecture are deeply influenced. A remarkable City, not only because of the famous Ybor City, in the 1920s the US-Cigar-Capitol. Ybor City has been reconstructed, the historical buildings and the State Museum are worth seeing and a stroll along the streets of Ybor City is like a journey back in time. St. Petersburg is famous for its Salvador-Dali-Collection. 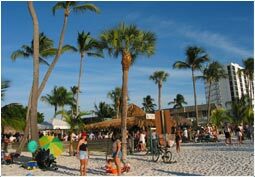 St. Pete Beach, more than 3 miles long, is very popular. The “Don CeSar Resort” is a pink palace, a hotel built in 1920, located at the southern tip of the beach. 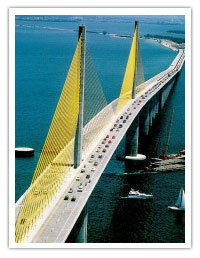 Don’t miss to take the Sunshine Skyway Bridge to cross Tampa Bay. This masterpiece of Architecture can even be seen from an airplane. Some of Florida’s best beaches are found along the gorgeous coastline of the Gulf of Mexico. Venice Beach (a wonderful beach), for example, is well-known for prehistoric shark-teeth among fossil-hunters. 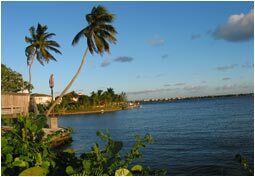 And now I would like to introduce the Lee Island Coast – Ft. Myers and vicinity and of course Cape Coral, our hometown. In 1835 Thomas Alva Edison (he invented the light bulb) decided to make Ft. Myers his private winter-paradise. He was so attracted by the climate and the location, that he decided, to get a winter-residence including laboratory and botanical garden there. In the following decades he left Maine every winter to spent that time of the year in his Floridian-winter home in Ft. Myers – his house has become a museum and visitors are welcome to visit the winter home, lab and garden. Another famous site of Ft. Myers is McGregor Boulevard, a wonderful Avenue connecting Ft. Myers and Sanibel Island, with approximately 2000 King-palms along the way on each side of the road. 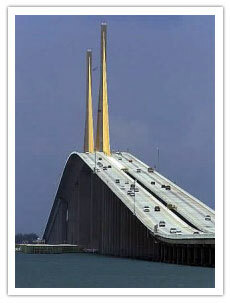 That road gave Ft. Myers the Nickname: “City of Palms”. Ft. Myers, as well the “old” part of the town on the banks of the Caloosahatchee-River, is characterized by historical buildings and giant Banyan-trees. A remarkable refuge for manatees (sea cows) is located just a few miles outside of Ft. Myers and helps saving those animals. 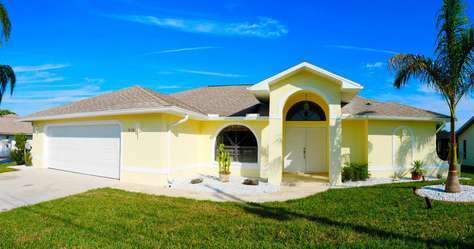 By Following State Route 78 (Pine Island Road) when driving from Ft. Myers to Cape Coral, which outskirts are embraced by mangroves, you will reach the wonderful Islands Matlacha and Pine Island. On Matlacha, located in the middle of a bay with mangrove-islands, life seems to stand still, the little houses are colorful and the hippie-generation is still alive here. Pine Island, now thanks to the climate home for fruit-plantations and peaceful neighborhoods, was discovered by Ponce de Leon in 1523. Eight years later, after an unsuccessful search for gold and the fountain of youth, he was killed on Pine Island – penetrated from the arrow of a Caloosa-warrior. The Babcock Ranch, a natural habitant for over 900 sorts of trees, plants and a lot of endangered animals like Alligators, Buffalos and the rare Florida panther, is located just 30 minutes away from Ft. Myers. 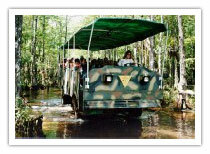 The surface-area is almost the same size as New York City and visitors are taken on a 90-minute-Tour through jungle and swamp, riding on a swamp-buggy. Ft. Myers beach (Estero Island) is called Family Island Playground – and it keeps this promise. 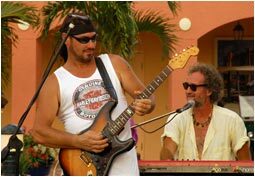 Restaurants, Bars, Beach resorts and Shops – a variety of entertainment can be found along Estero Boulevard. Beach access is provided along the Boulevard and parking lots are near by. 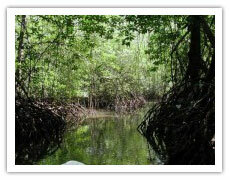 Sports of all kinds (parasailing, water-skiing, golf and more) can be enjoyed but unspoiled nature is right at hand, also. 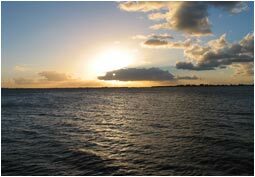 “Matanzas Pass Wilderness Preserve” as well as the “Carl E. Johnson Park” and “Lovers Key State Recreation Area” are located just a few miles from Ft. Myers Beach. 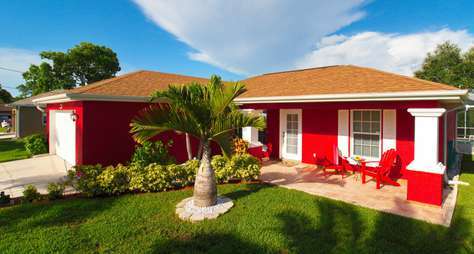 Bonita Springs, located between Ft. Myers and Naples, offers more than 15 miles of white beaches and the tropical wonderland of Imperial River, which can be best explored by boat. Naples is famous around the world for more than 50 excellent golf-courses and is known as the wealthiest and fastest growing area in the US. It is paradise for everyone who loves sports and for everyone who loves elegant shopping along Historical Fifth Avenue or at the “Village on Venetian Bay”. 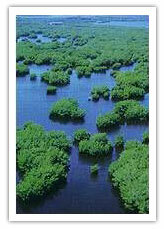 At the southern tip of Florida are the Everglades, where a shallow freshwater river moves slowly toward the sea. 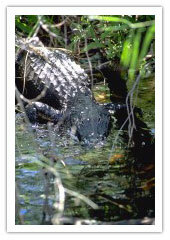 It is the home of Alligators, crocodiles and many different kinds of birds, other animals and plants. The landscape is unique and can be explored by car, canoe or tram, either guided or not. Enchanted Trails lead into the wilderness and overlooks provide a gorgeous view over the endless grassland. Airboat tours are offered all along the access-roads leading towards the Everglades – and some restaurants there got a strange kind of specialty: crispy-fried “Gator-tail”. 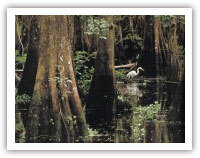 In the 19th Century, during the second Seminole-war, the Everglades gave shelter to the Indians. Modern Native Americans take pride in their traditions, the Big-Cypress-Reservation-Museum provides all kinds of information regarding culture and history of the original inhabitants of Florida. Today the Seminole-Indian-Casinos became a very special kind of attraction to be found in this countryside.